Nine out of 10 refrigerators used by consumers worldwide have a ‘heart’ (compressor) that isn’t that smart. A compressor is the core part of a refrigerator that circulates cool air. If compared to the human body, it would be the heart, and to automobiles, the engine. Samsung’s refrigerators have a digital inverter compressor that automatically perceives environmental changes caused by the surrounding temperature, opening and closing of the door, as well as the operating mode, and adjusts its operating speed accordingly. Yet, approximately 90 per cent of refrigerators in the world are equipped with conventional, fixed speed compressors. This compressor operates at a fixed maximum speed even when only a little amount of cold air is required, ultimately consuming a lot of unnecessary energy and making noises. Samsung refrigerators are smart and have a ‘strong heart’ that maintains performance evenly for as long as 21 years. The Samsung digital inverter compressor operates by automatically detecting changes in the surrounding environment. It instantly responds to temperature change like people hunching their bodies in cold weather. 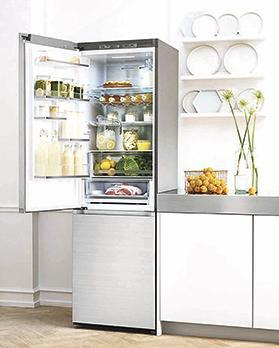 The temperature inside the refrigerator rises when the door is opened and closed frequently, or when the surrounding temperature increases in the summer. In such cases, the compressor operates intensely as cool air must be injected quickly. Samsung compressors do not require complex handling because they automatically detect these changes and operate at an optimal speed. As a Samsung digital inverter compressor stops or slows its operation when the cool air is not required as much, such as at night or in the winter, it significantly increases power efficiency. The variable-speed refrigerating technology unique to the digital inverter can save power consumption by an average of 30 per cent compared to other compressors that operate at a fixed. Samsung digital inverter compressors stop operation or operate silently at low speed at night, dawn or even daytime if the refrigerator door is not frequently opened and closed. After more than 300,000 tests for 120 days, the German certificate authority VDE (Verband Deutscher Elektrotechnicker) issued a lifespan certificate of 21 years to Samsung digital inverter compressors. There is a motor inside Samsung compressors and the compressor changes the rotational motion of the motor into linear piston motion, compressing and circulating refrigerants. This can be compared to a car’s engine, which requires a high level of reliability. Samsung achieved strong durability by incorporating the digital inverter control system with its unrivaled nano-processing technology, which has been developed on based on Samsung’s accumulated experience of manufacturing over two hundred million compressors in the last over 40 years. In addition to the strengths of a Samsung’s digital compressor, it is worthwhile to note Samsung’s strong manufacturing competitiveness. Samsung manufactures one compressor every second. It produces 54,200 compressors daily by operating the manufacturing line for 16 hours a day. These compressors are used in various products including Samsung refrigerators, and Samsung is planning to apply digital inverter compressors to all of its refrigerators by next year to enhance competitiveness. Samsung offers a 10-year guarantee on all digital invertor compressors. This offers unparallelled peace of mind as well as a bold endorsement of quality of its products. The full range of Digital Inverter Samsung Refrigerators can be experienced at Sound Machine, the local representative.